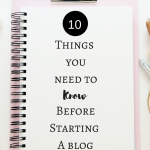 June 2, 2017 By Morgan M Woods Leave a Comment This post may contain affiliate links. 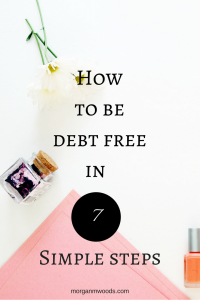 I know I’m not the only one who has struggled with debt, so I thought I would share my strategies for getting out of it with you. To give you an idea of the amount of debt I had and how quickly I paid it off… I paid off £4,000 worth of debt in around 5 months. Please bear in mind I’m only telling you how I got myself out of debt, I’m not a debt expert. I could set myself the goal of paying off £2,000 of my debt in 4 months. I could write out a plan of how I’m going to do it, but for some reason I only pay off £500 of my debt. Am I going to be disappointed? No! Because I’ve still paid off £500 of debt. What I will do is take a look at my plan, re adjust and set a new goal. 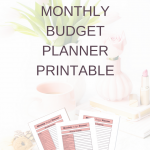 Using this free budget planner write down all your existing income and outgoings. Writing it out like this you’ll see where your money is going and how much you have left over. This is a super useful tool, I love to see where my money is going each month to plan for other expenses. If you’ve written out your budget and your outgoings outweigh your income, work out where you can cut back. Maybe you buy your lunch every day and could start taking your own from home? 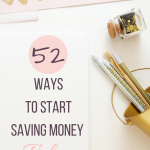 If you can’t think of any ways to cut back try these blog posts 52 ways you can save money, 15 money saving iPhone apps . If you would like to put your name down for my upcoming FREE save money in 7 days course please register your interest here. If you’re super serious about paying off your debts I would recommend looking for extra ways to make an income. If you have a house full of old stuff you no longer use then get on eBay. 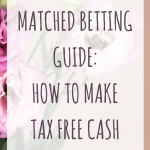 Have you heard of matched betting? 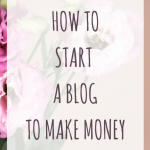 Its one of my favourite side hustles and how I consistently make £500 extra cash each month. Have you thought about doing surveys? Here are my favourite survey sites. 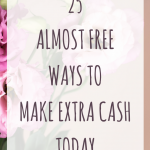 If you’re still stuck for ideas check out 25 almost free ways to make extra cash today & How you can make money from your smartphone. This is a tricky one really and not everyone would agree with me. If your debt is costing you more than your savings are earning in interest, it could be time to stop saving and pay off more debt. This will depend on your situation, but just something to think about. Step 6. Could you shift the debt? Is it possible for you to shift your debt onto a cheaper credit card? This is only a temporary action but could prevent your interest skyrocketing and getting out of control. Could you get any help with benefits? To find out, try entitledto & turn2us. They both have benefits calculators to work out if you could claim. 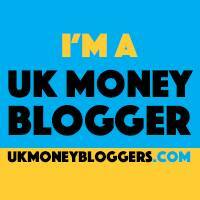 If you are in a really difficult financial situation and you feel you need more help with managing your debts I’ve listed some places below. Like I said at the top of the page this is only on my personal experience, I am no expert.